First United Methodist Church raised the steeple Thursday on its new sanctuary under construction at Poplar and Second. It’s the crowning outward touch on the Downtown church’s comeback from a devastating 2006 fire. 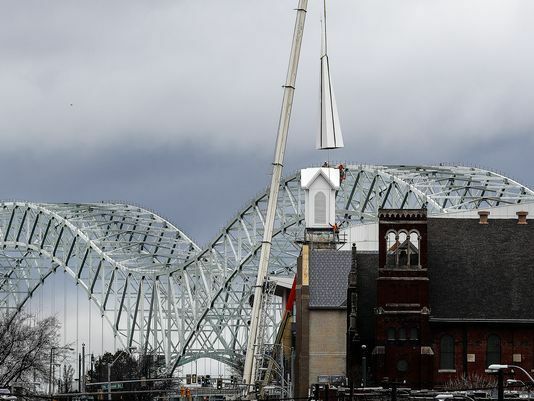 Although the congregation is still fundraising to get the building ready to occupy, the steeple raising is a milestone in a 12-year recovery from the fire that destroyed the 113-year-old sanctuary and its iconic spire. Workers directed by Chris Woods Construction lifted the cross-topped steeple into place Thursday morning. It tops out around 130 feet over street level — about 10 feet lower than the original, architect and church member Bill Wage said. It’s a modern interpretation of the original, representing the historic church’s changing mission from primarily a worship cathedral to one that ministers to Downtown’s population, including the homeless and hungry. “It is going to reach almost as far into the sky as originally designed and built,” Wage said. “It will be visible from far away, but it will be a more contemporary design. … It doesn’t look exactly like it, but it takes on that theme and character,” Wage added. The steeple was prefabricated in three sections of fiberglass on a steel structure by Fiberglass Specialties of Henderson, Texas. It was trucked to Memphis on a flatbed and arrived Tuesday. Wage’s sanctuary design includes a brick façade on Second, incorporating some granite and limestone salvaged from the fire. A wall of windows facing Poplar showcases structural steel framing, which the church installed in the first phase of rebuilding, and which became an architectural attraction in its own right. ”When we got into the steeple, I had some photos of the original building, and we didn’t want to depart from that too much,” Wage said. First United Methodist’s steeple had been rebuilt over the years but was one of few intact steeples on Downtown churches. The replacement has louvers that can be opened for installation of a bell or carillon at a later date. The original bell was smashed, but pieces were saved and are intended to become part of an art element in the future. The cross is made of 2-inch-by-2-inch aluminum tubing. Rambo said the steeple raising is a significant milestone in the march toward a new $4.2 million sanctuary. The church is close to raising enough money to make the building suitable for occupancy, though no opening date has been scheduled, he said. “We’ve got a beautiful shell, but we need to bring life to that empty shell so we can continue to serve our Downtown community,” Rambo said. Jerry Wagley, husband of former pastor Martha Wagley and building committee chairman, recalled watching as the the historic steeple came crashing down into Second Street the night of the fire. “It’s an exciting day to get the new steeple,” Wagley said.